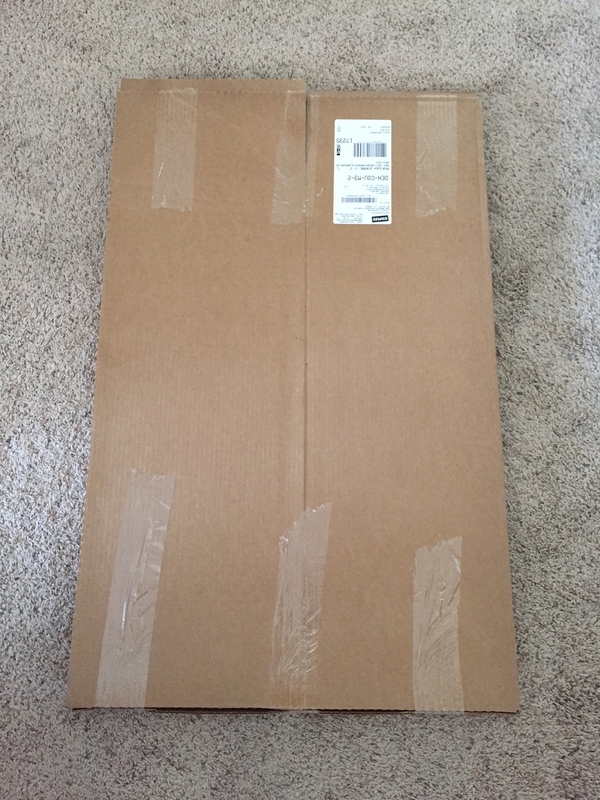 Large piece of cardboard. 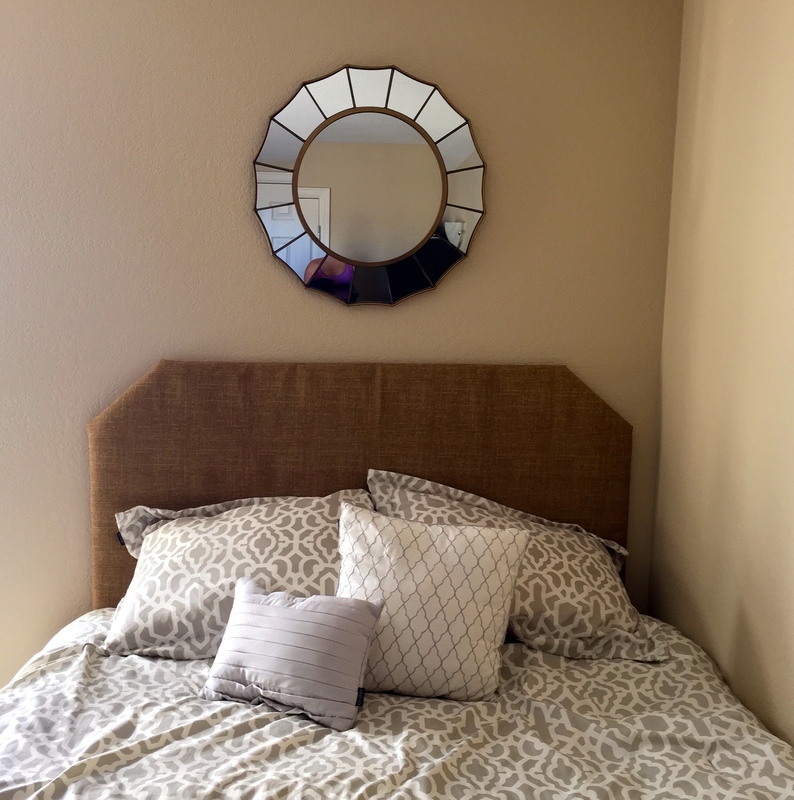 I made a queen headboard and used a piece of cardboard that was 60″ wide x 30″ high. I got this for free when my coworker got a new whiteboard for her cube! 2y fabric. 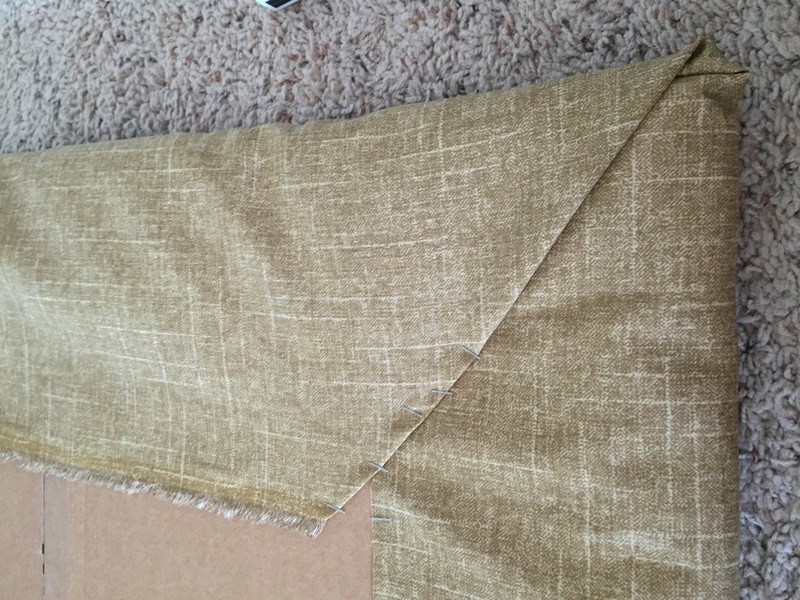 I used outdoor upholstery fabric that I found at Joann Fabric in the clearance section for $5/yard. Iron your fabric before you work with it. 2y batting. 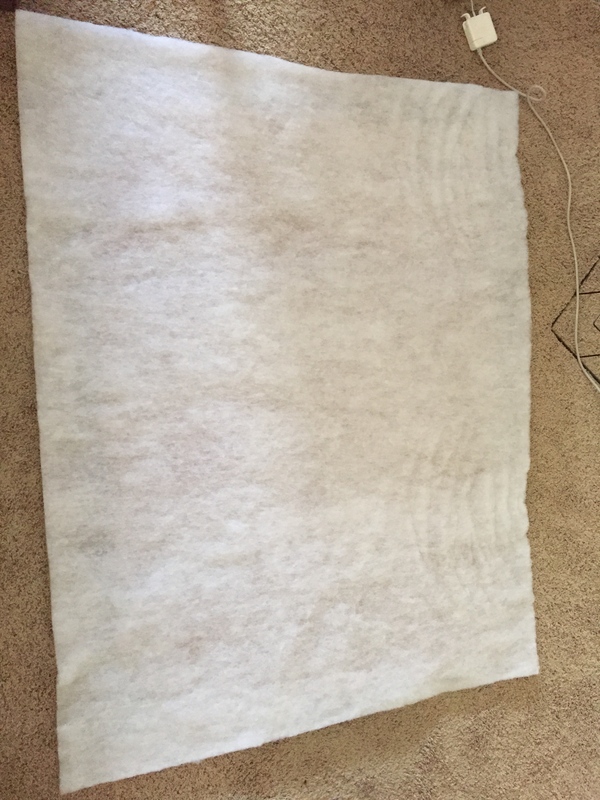 I used the cheapest stuff I could find, which happened to be the fluffiest. It was $3/yard at Joann Fabric (with a coupon). Staple gun and staples. I have an Arrow staple gun and used Arrow JT-21 light duty staples. 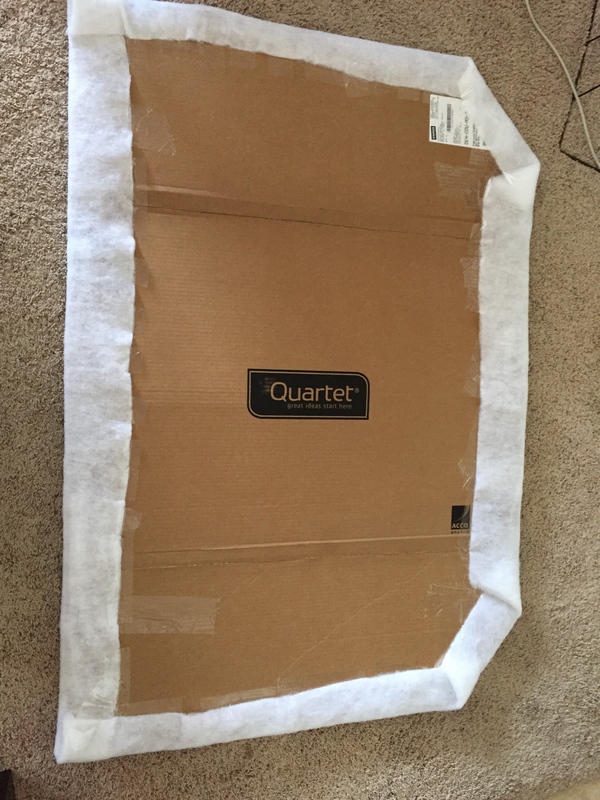 Cut your cardboard to the desired size. 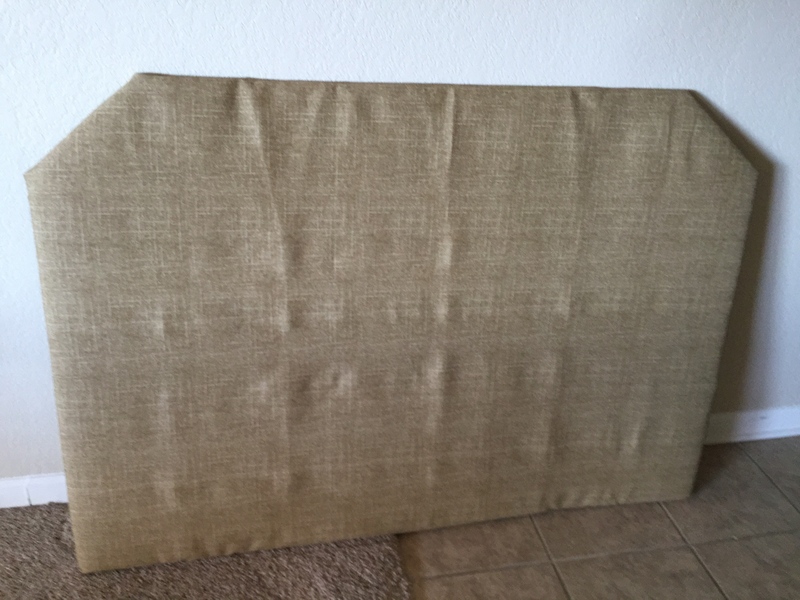 I cut mine to be 60″ x 30″ then cut the corners at an angle to add some character. 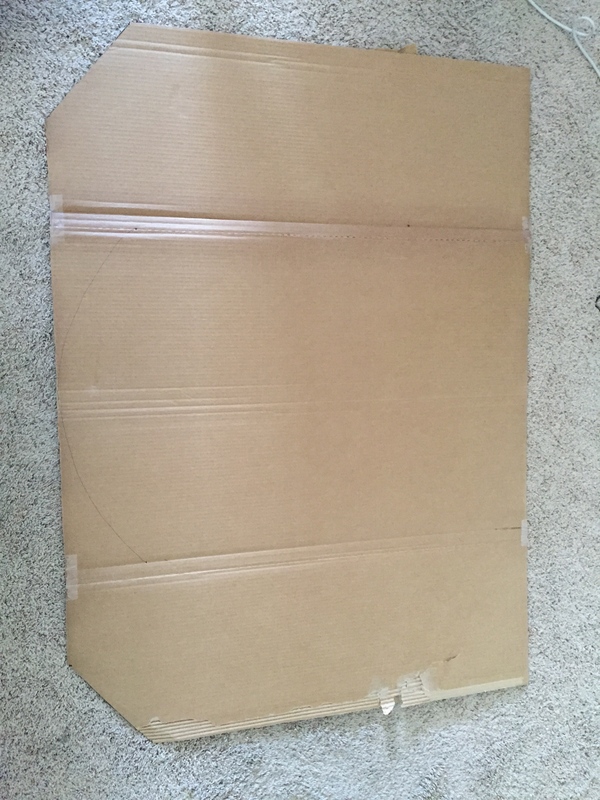 Cut your batting to be about the size of your cardboard with 2-3″ of overlap. 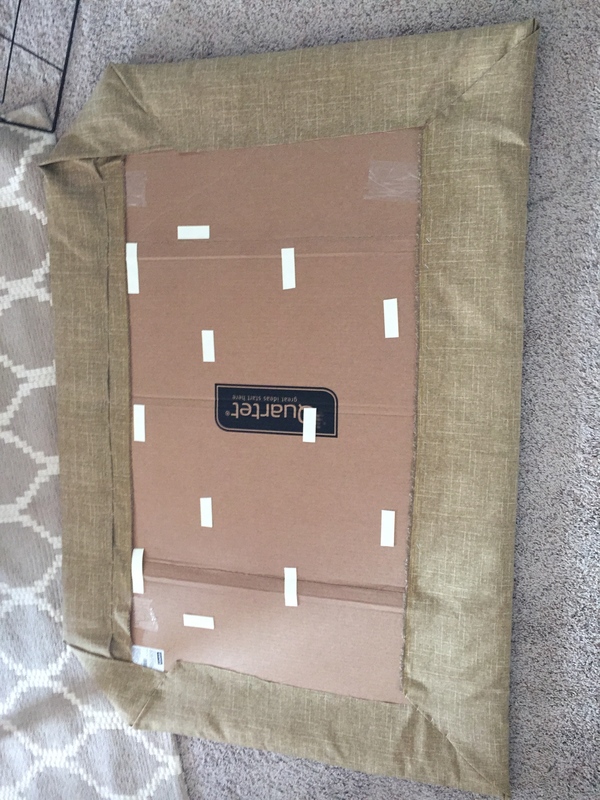 Lay your cardboard on top of your piece of batting. 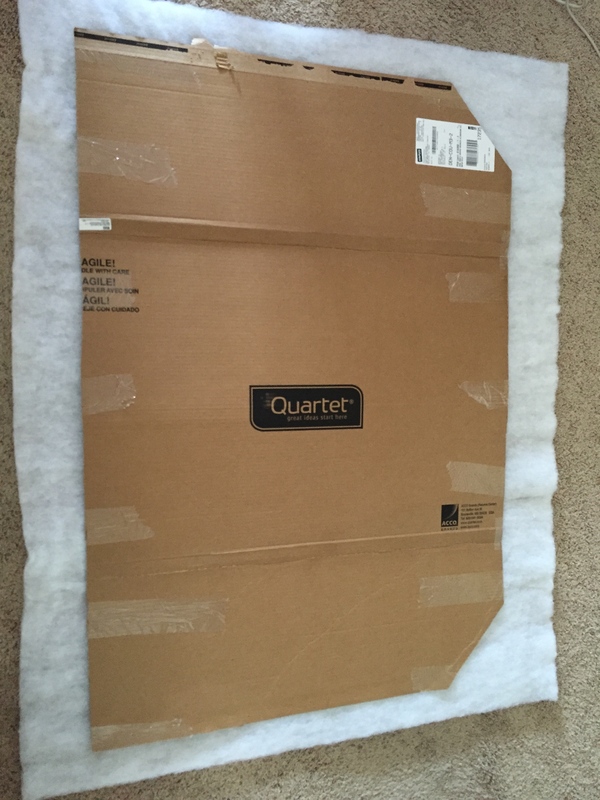 Wrap the batting around the cardboard and secure with pieces of packing tape. When you get to the corners, fold one side over the other and tape. 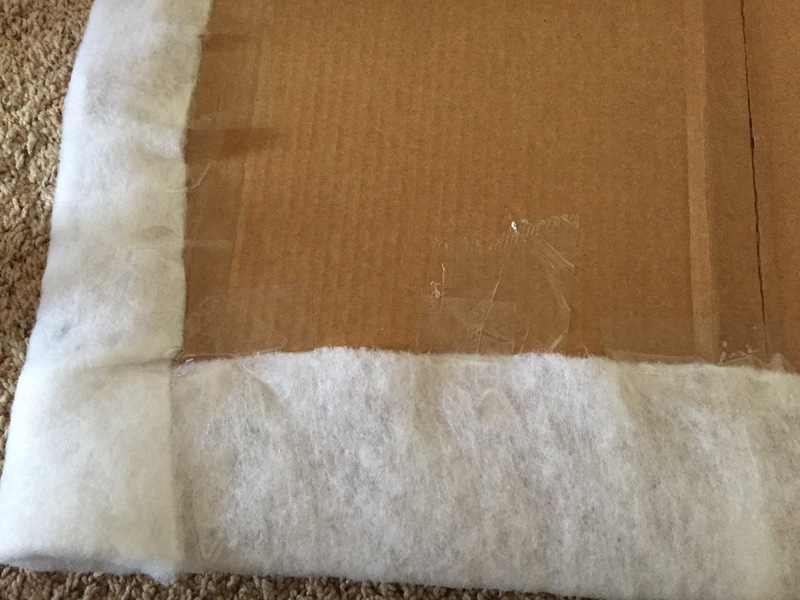 Keep taping until all the batting is wrapped around the cardboard. 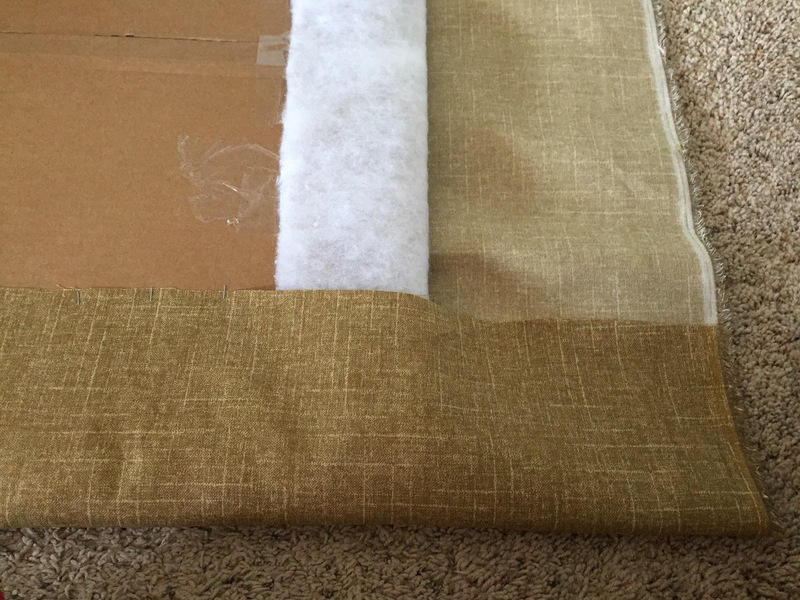 Cut your piece of fabric to be about the size of your cardboard with 2-3″ of overlap. 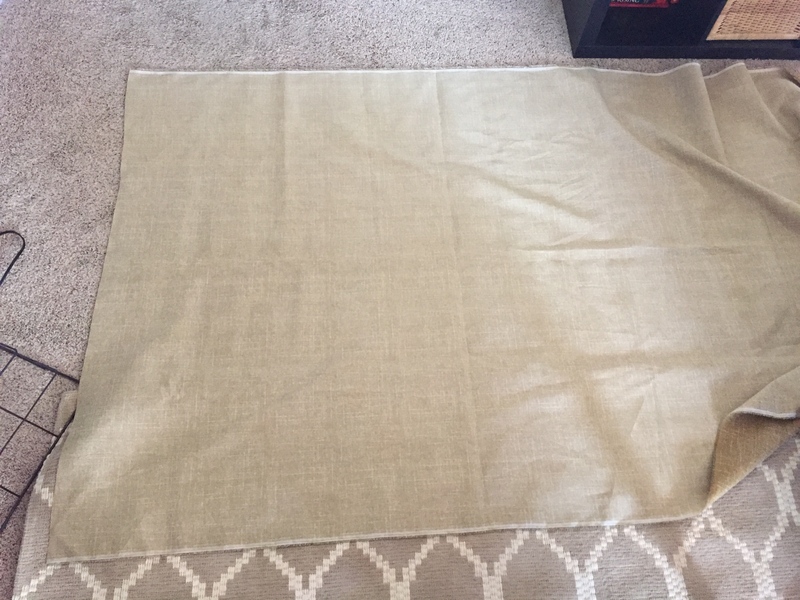 Lay the piece of fabric on the floor, patterned side down. 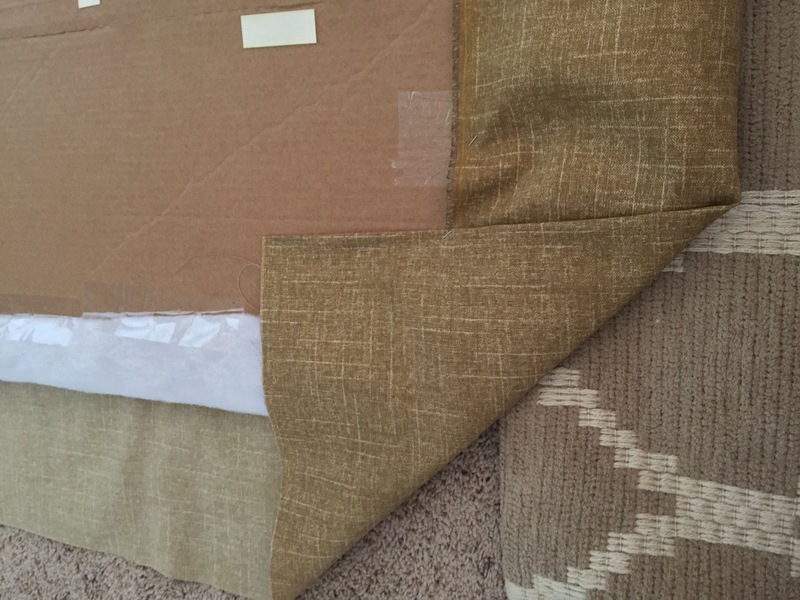 Place the cardboard and batting on top to the fabric. 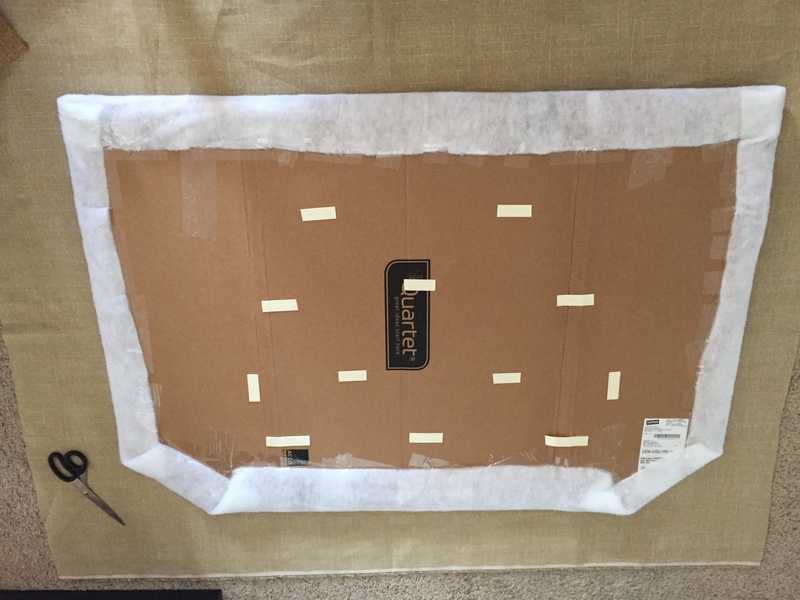 Wrap the fabric around the cardboard, securing it with staples. 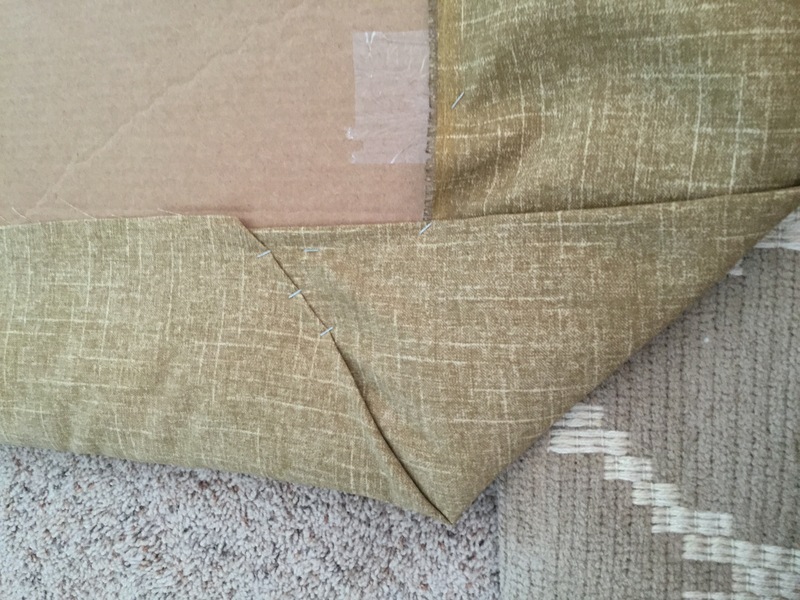 When you get to the diagonal corner, fold the fabric over the diagonal piece, staple it, then fold the other straight edge piece over the straight edge and staple. When you get to the square corners, fold one side and staple it. 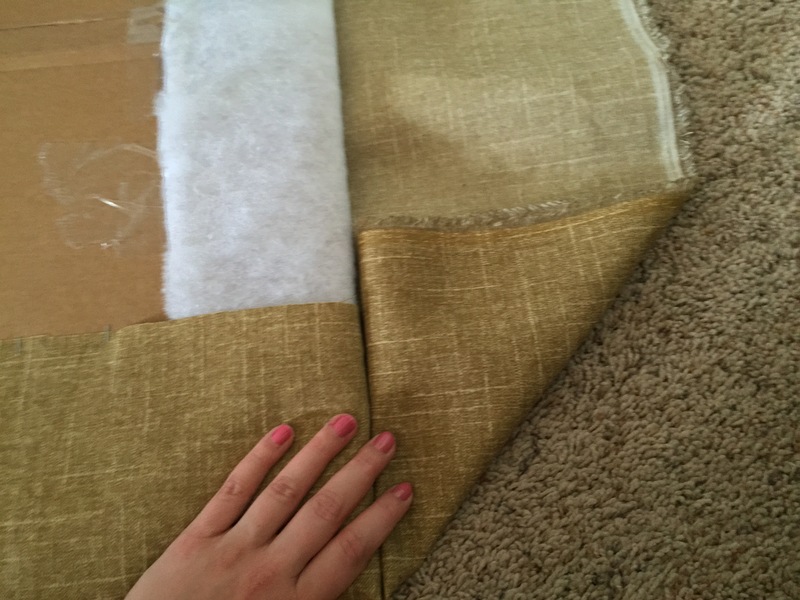 Then, bring the corner in towards the straight edge, fold the long piece over the fold, and staple it. Keep stapling until the entire piece of fabric is secured with staples. 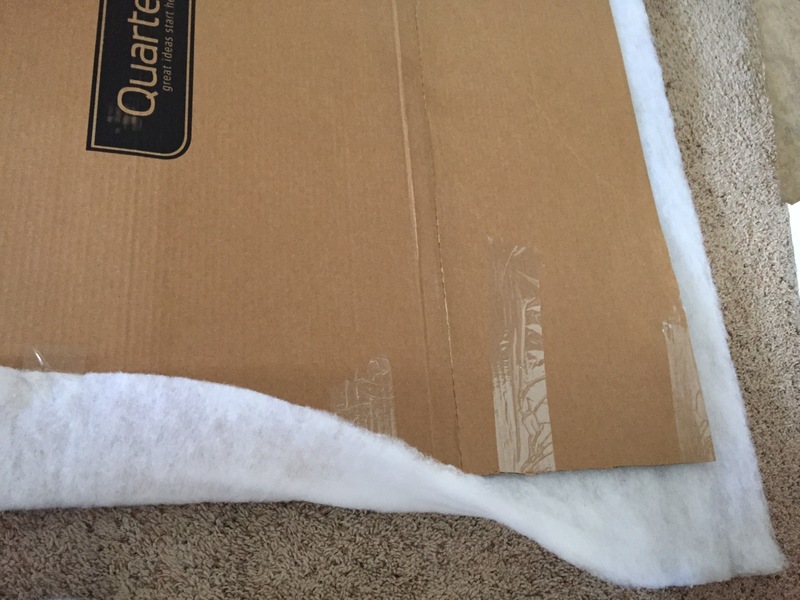 Next, cut the 3M tape into 2-3″ strips and stick to the back of the cardboard. Be generous with the tape! Peel the backing off the tape. 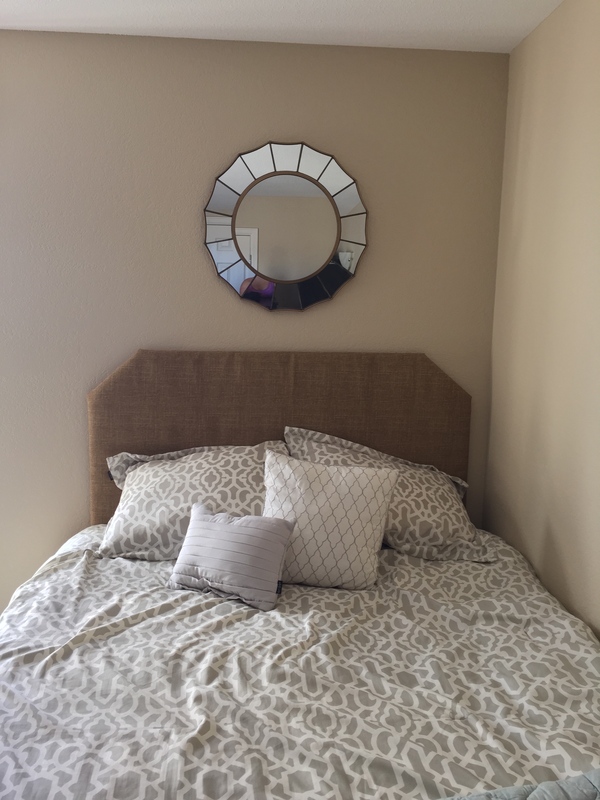 To hang it, hold it really close to the wall and place a level on the top of the headboard to make sure it’s straight. Once it’s where you want it, push on it to stick it to the wall and make all the tape stick. Enjoy your cheap headboard! I might add nailhead trim, what do you think?